The Maya calendar (and time keeping in pre-Columbian Mesoamerica) is a fascinating but poorly understood topic that has gathered much interest in recent years (particularly around 2012!). In this article, we will explain how the Maya calendar was made, how it works and how to read it. Time was extremely important to the Maya, they made elaborate and accurate calendars and used them in charting the movements of the sun, moon, stars and even planets. These calendars served a variety of purposes both practical and sacred. They were used in astronomical calculations, recording important events, the reigns of rulers and their conquests and also in divination. NB: specialists say “Maya calendar” and not “Mayan calendar” (see: 10 red-flags for spotting an unreliable online resources). How does the Maya calendar work? In the late 19th century, Ernst Forstemann worked out how the Maya marked time. 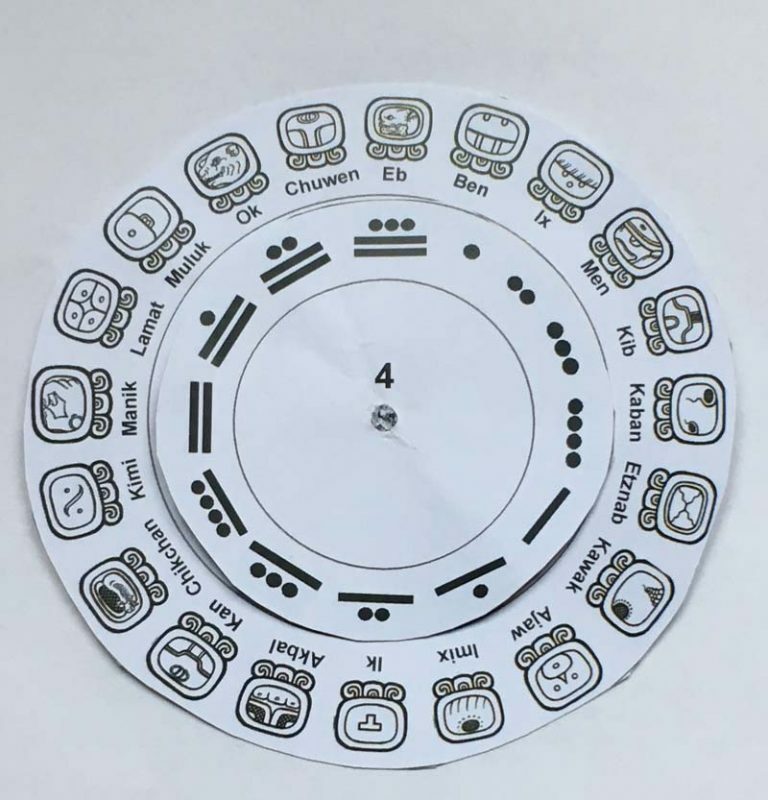 The Maya used what is now known as the calendar round which is made up of 3 interlocking cycles. A cycle of 20 names, a cycle of 13 numbers (which forms the 260-day sacred calendar) and a 365 days solar year. 52 years will pass until the three cycles line up again. The sacred calendar (Tzolk’in) 260 days. 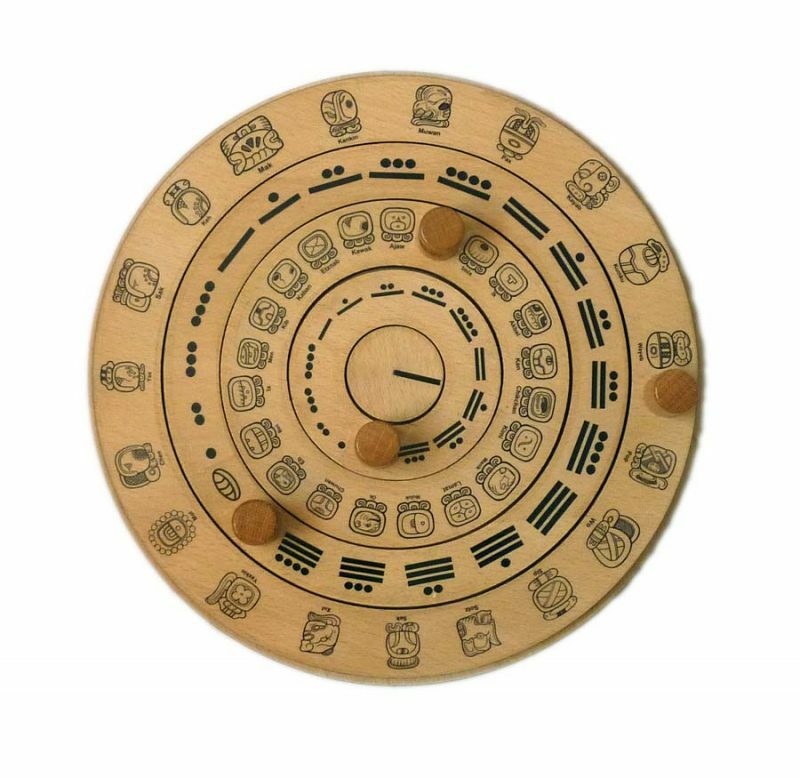 The 260-day calendar, also known as the Sacred Calendar or Tzolk’in in Maya, has 20 day associated with the numbers 1-13 (20 x 13 = 260). It would run as follow: 1 Imix, 2 Ik, 3 Akbal, 4 Kan… to 13 Ben, then numeral 1 would return and get associated with the fourteenth day: 1 Ix, then 2 Men, 3 Kib and so on continuing in an endless cycle. Every day was significant, similar to an astrology chart. For example: 4 would be 4 dots, 5 would be 1 bar, 10 would be 2 bars and 13 would be 2 bars and 3 dots. This contained 19 ‘months’ – 18 months of 20 days and a closing month of 5 days (Wayeb). For example: 0 Pop would be followed by 1 Pop, then 2 Pop, up to 19, then it would be 0 Wo, 1 Wo and so on. When these two calendars (Tzolkin and Haab) are working together, one day in this round such as “3 Kan 8 Pop” did not repeat until 52 years passed, which was called the Calendar Round. So you basically have a number + day + number + month. Moving on from this was their absolute dating system, which we call the Long Count. Like our own calendar the Maya marked dates for more extensive time from a fixed starting point. In our calendar it is the birth date of Christ, for the Classic Maya the beginning of the present creation was 13th August, 3114 BC. Each great cycle lasted 5125 years and it repeated indefinitely. The first great cycle was to end on 21 December 2012. This led to the popular idea that the Maya prophesied the world was to end on that date. 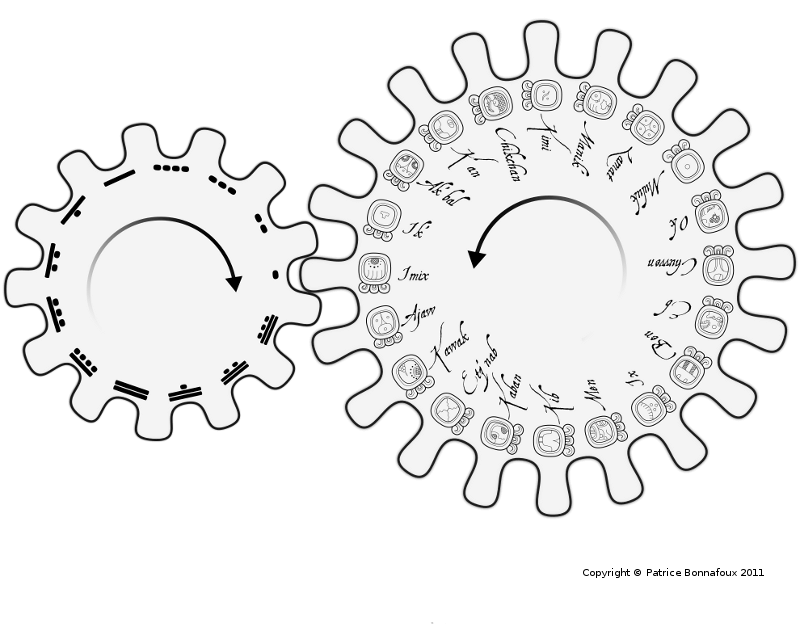 However, this is completely a modern invention, time was not lineal for the Maya, but cyclical and ever repeating. The 260-day count, which approximates the human gestation period, as well as the time it takes for a maize plant to come to fruition, is still used in some Maya communities today, mostly in the highlands of Guatemala. It was, and still is, a sacred almanac that provided a chronological framework for Maya ceremonial life, and a basis for prophecies. Birth dates were recorded by this calendar, and the patron deity of a particular day became closely associated with the destiny of babies born on that day. The Tzolk’in is a succession of 260 days made up of the permutation of 13 numbers with 20 names (13 x 20 = 260), very much in the same ways our months consist of the association of 7 week-days (Monday to Sunday) and 28, 29, 30 or 31 numerals (for example Friday the 13th which is the 13th day of the month and the 5th day of the week). 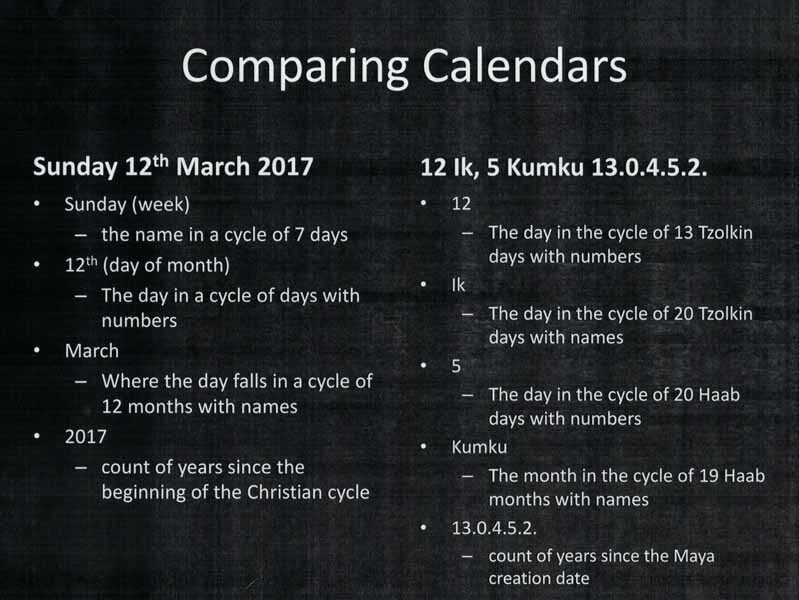 Each day is uniquely designated by the combination “coefficient/day-name”, and not until every single one of the numbers 1 through 13 had been attached to every one of the 20-day names was the cycle complete. It would take 260 solar days to complete. The first day of the Tzolk’in is “1 Imix”, the second is “2 Ik’”, the third is “3 Ak’bal”, the thirteenth is “13 Ben”, the fourteenth is “1 Ix”, the twenty-first is “8 Imix”, and so on. A particular combination will not recur until 260 days have elapsed. 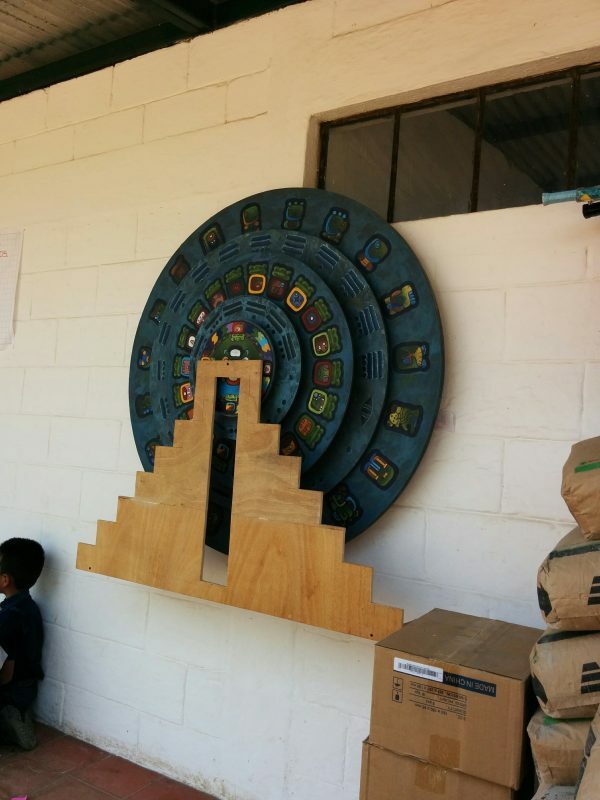 This sacred calendar is still used by the highland Maya people today. 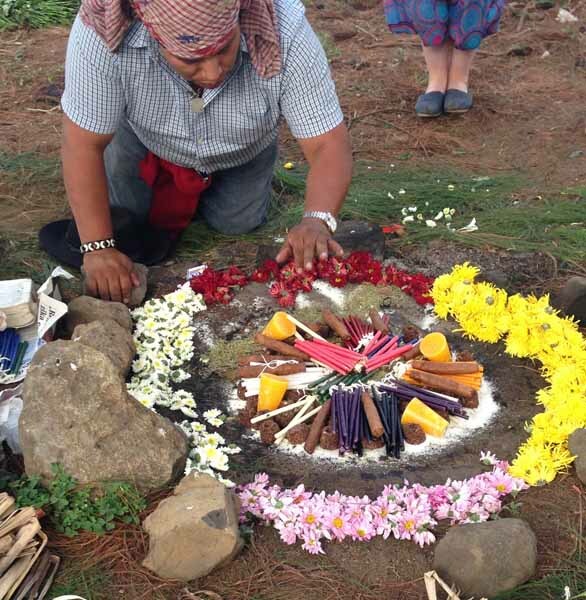 Each community has their day keeper, generally a shaman, who carries out ceremonies on particular days of this calendar. People will go to the day keepers to ask questions about their future or help in curing an illness. Day keepers then ask the spirits for guidance. Both the ancient and highland modern Maya believe that they have a spirit/animal companion, the ancient Maya called it Way (pronounced ‘Why’) and the Maya today call it their nahual/nawale. Your birthdate defines what animal/spirit companion you have and also tells you your character traits. Below is the list of the 20 nahales and their respective calendar name, both in the Yucatecan Mayan language (in italic) and the highland Mayan language of Kaqchikel (in bold). Finding out what animal companion you are related too and your personality traits is the theme of my next blog – so watch this space! Sometimes called the “Vague year” because leap year adjustment was never intercalated, the Haab is a 365-day period. It is made up of 18 months of 20 days, and an extra month, called Wayeb, of only 5 days at the end of the year which gives a total of 365 days. Those 5 extra days were usually considered to be a special time. 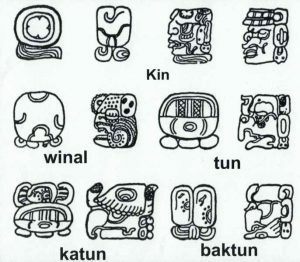 The months’ names are all taken from the Maya Yukatek list given to us by Bishop Diego de Landa in the 16th century: Pop, Wo, Sip, Sots’, Sek, Xul, Yexk’in, Mol, Ch’en, Yax, Sak, Keh, Mak, K’ank’in, Muwan, Pax, K’ayab, Kumk’u and Wayeb. The unusual aspect of this calendar is that the “seating” of a given month is not considered as the first day of the month but rather as the last day of the previous one. This is akin to the tradition of calling December 31st “New Years Eve”. In the Maya concept of time, the influence of a given month started on the last day of the previous one. 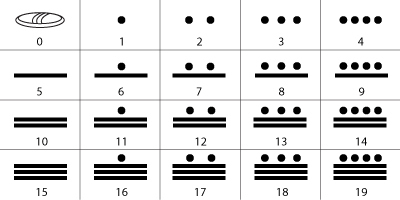 Below: names and glyphs of the Haab the nineteen months. A Calendar Round date gives the position of a given day in both the 260-day count (Tzolk’in) and the 365-day count (Haab). It is always written in the same order: (1) day coefficient + day name in the Tzolk’in, and (2) day number + month name in the Haab. For example, January 9th 2012 was 8 Ben 1 Muwan in the Calendar Round. Since 260 and 365 have a least common denominator of 5, it will take 18,980 days (260×365/5), approximately 52 years, before a specific date in the Calendar Round recurs. The 52-year count was in use throughout Mesoamerica. The Mexica (Aztecs), for example, called these periods xiuhmolpilli, meaning “year bundle”. The start of a new xiuhmolpilli was cause for much celebration. The Maya name for these 52-year period is not known. The association of the 20-day cycle in the Tzolk’in and the 20-day months in the Haab creates a noteworthy phenomenon: for any given year, the first day of all the months in the Haab will start with the same Tzolk’in day. For example, if the first day of the year (1 Pop) falls on a day Ben in the Tzolk’in, then the first day of every month in that year will be on a day Ben. These days are called “Year Bearers”. Given of the short month of 5 days (Wayeb) at the end of the Haab, the first day of the following year has to be 5 days later in the Tzolk’in. Since there are only 20 days in the latter, there can be only 4 Year Bearers. During the Classic times, these were Ak’bal, Lamat, Ben, and Etz’nab. The same traditional Year-bearer pattern continues to hold in some traditional highland Maya communities. 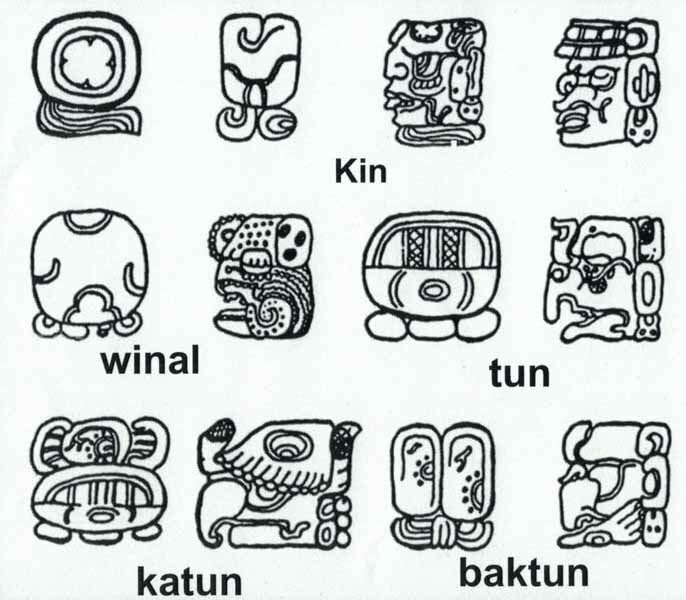 By the time of European contact, however, the Year-bearers used in the Yucatec calendar were K’an, Muluk, Ix, and Kawak. Moving on from this was their absolute dating system, which we call the Long Count. Like our own calendar the Maya marked dates for more extensive time from a fixed starting point. In our calendar it is the birth date of Christ, for the Classic Maya the beginning of the present creation was 13th August, 3114 BC. Each great cycle lasted 5125 years and it repeated indefinitely. Every inscription began with the date, usually the long count date and then followed by the calendar round (Tzolk’in date + Haab date). How accurate is the Maya calendar? The Maya did not use any system of leap days, so the Haab had an error rate of 1 day every 4 years when compared to the real solar year. How many days did the Maya calendar have? The Haab has 365 days (18 months of 20 days + 5). The Tzolk’in has 260 days (20 names and 13 numbers). The calendar round has 18,980 days (52 years). Did the ancient Maya predicted that the world would end on 21 December 2012? No, they didn’t! A great cycle of the Maya Long Count was to end on 21 December 2012, but the next day the Maya believed that a new cycle would begin. There was to be no end of the world. In fact, in the temple of inscriptions at Palenque, where we find the tomb of King Pakal, it was written that in AD 4772 the people would be celebrating the anniversary of the coronation of their King Pakal. Lesson Plan (KS2) – Please note that if you are having problems downloading these files then please use your personal, rather than school’s email address. Some schools disable the ability to receive items outside of their domain. This book includes a chapter on Time and the Calendar. 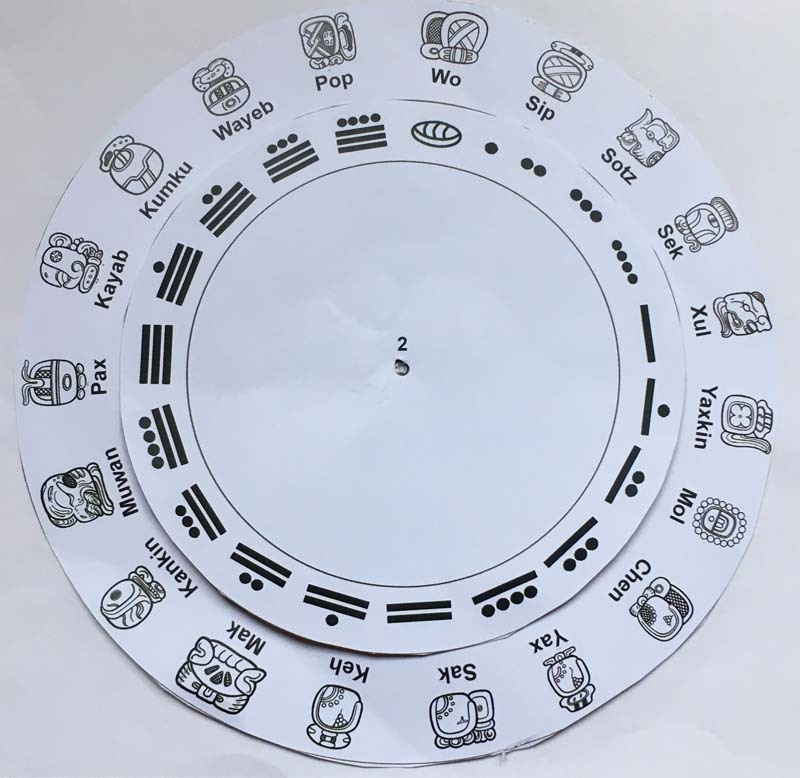 7 Responses to "The Maya Calendar Explained (KS2)"
Hi, i wanna congratulate you for this post. It’s so complete and precise. Sorry if i don’t write very good it’s because i am from Argentina. Thanks! Really help me in my presentation! Thank you, i am glad you found it of use. Your English is perfect, actually i lived in Argentina for awhile and my dog is from Buenos Aires! Thank you, I am glad it is of use.